Last Wednesday, October 28, I presented 'Global Agricultural Concept Scheme: The collaborative integration of three thesauri' at the annual conference of the German Coalition for Networked Information, held this year at the German National Library in Frankfurt under the banner 'Linked Data - Vision and Reality'. The presentation was well received by representatives of libraries, archives, and research institutes in Germany. The slides present progress towards a Global Agricultural Concept Scheme (GACS) and describe how GACS fits into a broader vision, outlined at a July 2015 workshop, for an Agrisemantics platform. GACS is a joint undertaking of FAO, CAB International, and the USDA National Agricultural Library to integrate three big thesauri in agriculture - AGROVOC, CAB Thesaurus, and NAL Thesaurus around a common set of widely used descriptors for describing bibliographic databases such as AGRIS, CAB Abstracts and Agricola. achieve efficiences through cooperative maintenance. Of the 32,000 concepts for AGROVOC,140,000 for CAB Thesaurus, and 53,000 for NAL Thesaurus, the 10,000 most commonly used concepts from each were automatically mapped, then the mappings were checked by hand and problematic mappings were resolved through discussion. These mappings were then used to generate a draft concept scheme ("GACS Beta") with 15,406 concepts and 398,216 labels in 28 languages. The draft concept scheme will next be moved into a distributed, Web-based editorial environment, VocBench, and displayed for browsing (and download on the Web as Linked Data) using the SKOSMOS platform. The GACS Working Group is completing a thorough quality check of GACS and of its semantic structure prior to its release in early 2016. 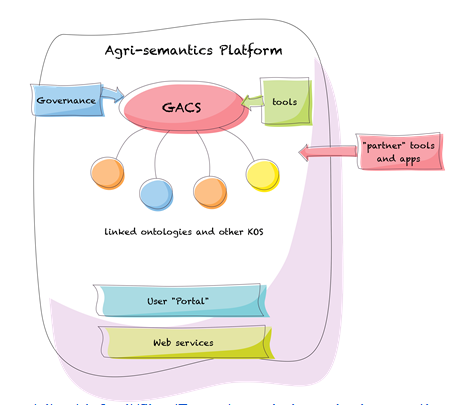 The Agrisemantics vision aims at using GACS as a focal point linking out to more application-specific vocabularies, thesauri, code lists, and ontologies for the purpose of improving the interoperability and coherence of information and datasets related to agriculture. These presentation slides will be replaced by a final, corrected version on the conference website and may be released as a YouTube video or webinar.